BODYSHRED™– is a fun, effective, 30-minute, high intensity, metabolic conditioning workout. Utilizing Jillian Michaels’ 3-2-1 interval approach to whole body circuit training, BODYSHRED™ is kinetic, energetic, and provides the ultimate challenge. Boot Camp: A fun and challenging co-ed workout that is different each week. Various stations challenge muscle strength, agility, endurance, and balance. Combined with traditional calisthenics this class will never get old. Weather permitting, we do go outside. Cardio Barre is a unique, high energy/no impact exercise class that combines barre work and lightweights with continual cardio fat burning motion. Central to the workout are toning and resistance exercises for the booty, legs, torso and arms to sculpt muscles and elongate the muscles in the body. Circuit Training -will keep you moving, building muscle, and burning calories in a fun group setting. Dance Fusion– High-energy choreography fuses with strength training and conditioning for a full body workout. Fierce-This full-body, full-hour sweat session alternates cardio and strength moves to help you find your next level of fitness, or your new definition of FIERCE! This interval based class uses strength moves with hand weights/plates, body weight, and simple cardio moves. Expect to work, expect to have fun, and expect to find your FIERCE! Fit and Over Fifty: This class is designed for the older active adult, who wants a blend of exercises that addresses the cardiovascular, strength, balance, flexibility and stability issues everyone faces as they age. Balls, bars, free weights and bands are used. Foam mats for floor work. In addition, fun is involved; because research indicates that physical health and mental health are directly correlated! The Grind:Sometimes it feels great to just sweat it out! Class circuits will include various stations to work conditioning, lifting, balance, agility, and mental determination. All stations will be modified and intensified to meet everyone’s needs. No intimidation or judgement here, just come ready to work! INSANITY LIVE group exercise classes are predesigned, athletic, drill-based, interval workouts. The workouts are inspired by drills that athletes use to improve their sports performance. While it’s not necessary to be an athlete to take part in INSANITY LIVE workouts, nor is INSANITY LIVE intended to achieve such results for athletes, this was the inspiration for the program. In the same way that kickboxing fitness programs are inspired by martial arts, and ballet barre fitness programs are inspired by ballet, INSANITY LIVE allows everyday fitness enthusiasts to enjoy the nature and athleticism of drills training to achieve weight loss and overall fitness and wellness benefits. Kick, HIIT, & Sculpt-is twenty minutes of cardio kickboxing followed by intense cardio and strength training intervals. This is sure to get your heart pumping and muscles sculpted. 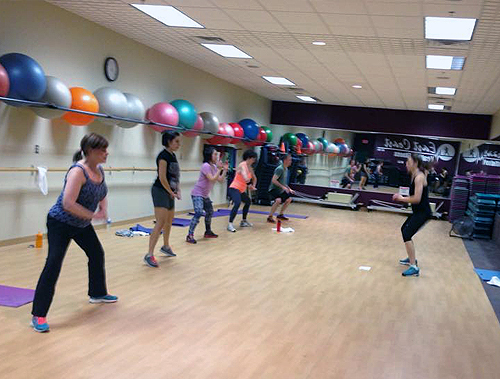 Lift and Sculpt: Group resistance training using free weights, tubes, bands, balls…you name it! No choreography. P90X Live is total body cardio and strength training class that uses body weight as well as dumbbells, barbells, weight plates, and resistance tubing. Each workout can be modified to accommodate a wide range of fitness levels. Pilates: The Classic Mat series of exercises to build and improve flexibility, strength, and posture, by focusing on core breathing and stability. A perfect asset to your fitness program. Pilates with Props infuses different pieces of equipment to the workout. All levels welcome. POUND®-Using Ripstix®, lightly weighted drumsticks engineered specifically for exercising, POUND® transforms drumming into an incredibly effective way of working out. Instead of listening to music, you become the music in this exhilarating full-body workout that combines cardio, conditioning, and strength training with yoga and Pilates-inspired movements. Designed for all fitness levels. SILVER AND FIT EXPERIENCE: This class is designed with the older adult in mind. A great blend of cardiovascular and weight training classes for moderate fitness levels. Soothing Stretch: just a relaxing, mind easing, stretching exercise class that focuses on lengthening the body, which helps to develop and maintain a healthy level of flexibility. It also incorporates a touch of yoga and Pilates exercises. SPINNING: Participants cycle together for an amazing overall body workout. You have to experience it yourself. Burn the calories. 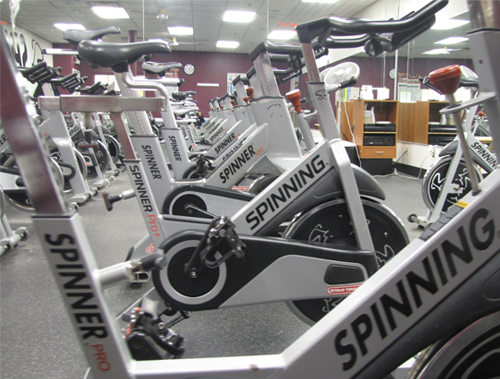 SPIN and CORE: This class combines Spinning and core training exercises that strengthen and stabilize the spine, shoulder and pelvic girdles for a more efficient ride. Vinyasa Flow: This moderate intensity class moves through a sequence of yoga poses that focus on slow, intentional moments while strengthening and lengthening the muscles. Open to all levels. Yogalates: A combination of Pilates & Yoga to stretch and strengthen your body. The emphasis is on core control in all poses and focus on breathing while in motion. The full body is covered, leaving you feeling toned and flexible! Zumba- is a fusion of Latin and International music / dance themes that create a dynamic, exciting, and based on the principle that a workout should be “FUN AND EASY TO DO.” The routines feature aerobic/fitness interval training with a combination of fast and slow rhythms that tone and sculpt the body. Flexibility is crucial to my fitness. Incorporating a good warm-up and cool-down into every session decreases my chances of injury. I use both dynamic and static stretching in my training. I’ve starting doing a few yoga sessions which incorporates muscle strength and flexibility.